American Wolf: Donald Trump: Unpresidented. President Trump peddling snake oil in Youngstown, OH, 7.25.2017. I was nine years old when I first learned to recite the Presidents backwards. Ever since, they have been a source of interest, of inspiration, a lens through which to better understand America in all of its ragged guts & glory. They exist as a set of 44 men who, at their best, represent the best that America can be. This is not true, however, of the current president. President Donald J. Trump is shaping up to be the joker in the deck, the one who taints the entire set by the mere presence of his inclusion. This is not just tragic, but ironic--no President has ever been more obsessed with the concept of "branding," & yet President Trump single-handedly ruins the brand of President. He is, to use his own mistaken term that was left up in a tweet for nearly an hour before it was taken down & corrected, "Unpresidented." 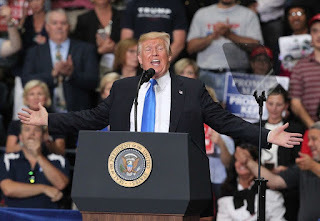 So last night, in one of his countless would-be election rally speeches in Youngstown, Ohio, when President Trump said that "With the exception of the late, great Abraham Lincoln, I can be more presidential than any other president," he had finally gone too far. I'm pretty sure President Trump initially ran for President as a publicity stunt to promote his then-dimming brand, & as time went on, found himself triggering something like a social movement he couldn't have predicted. Somehow this super-rich New York City elite who bragged about his adultery & had the speaking skills & morality of a 3rd grade bully won over the so-called Christian conservatives in the midwest & south. What was supposed to be referendum on America became a referendum on Hillary Clinton. As he continued to fall backwards into things going his way, Trump's insatiable ego took over. He must be great because every tells him he's great. He should be President because he is a Great Man because he must be. He is basically like Rodion Raskolnikov in Dostoevsky's Crime & Punishment, only instead of killing a helpless old lady, he killed our country. But the American People--or more tellingly, the Electoral College--called his bluff & made him President. As everyone waits with baited breath for the "real President Trump," he continues to be the only Trump there ever was: The self-absorbed jackass who blusters his way through everything with big empty promises, insults, & tweets. Even now that he is President, the campaigning never stops. Can you imagine if six months in, Obama still talked about McCain nearly every day or Bush had kept bringing up Gore? The only saving grace to this all is that Trump himself appears to hate his new job. I chalk it up to the fact that, until January 20, 2017, he hasn't really had to put in a hard day of work in probably 30 years. He's not used to doing it, & even worse, he's not interested in doing it. He's used to surrounding himself with his family (why do you think they all now work in the West Wing?) & letting them call the shots as he supplies the brand name like an honorary CEO. I've heard skeptics say that perhaps the weight of the office would inspire him to step up, but all signs thus far have indicated that he simply does not possess the mental ability to do so. Someone recently wrote that being President requires at least some level of intellectual curiosity, & President Trump appears to be entirely void in this way. He surrounds himself with yes-men & Fox News who don't dare to question his allegedly historic, "A+" Presidency, & everyone else is either wrong or "FAKE NEWS." It's basically like "The Emperor's New Clothes," & Trump is the clueless king who's complimented by his noblemen but stands naked to the world. Or perhaps, he's like King Lear, a fool who believes himself to be a wise man, railing against the storm in futility & rage. Whatever he is, it's not presidential & it's ruining the brand of men like George Washington, Thomas Jefferson, Abraham Lincoln, Theodore Roosevelt, & Franklin Roosevelt; let alone more recent ones like Dwight Eisenhower, John F. Kennedy, & Ronald Reagan. One of our worst Presidents, Warren G. Harding, who spent his time in office gambling & cheating on his wife while appointing his corrupt friends to government positions said, "I am not fit for this office & should never have been there." If only President Trump could have the wisdom of, um, Warren G. Harding.